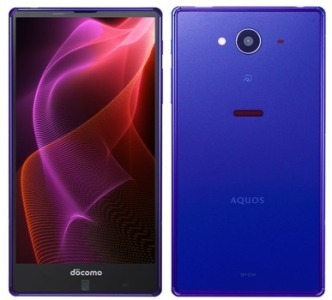 Sharp Corporation, a Japanese multinational corporation that designs and manufactures electronic products have announced three new smartphones AQUOS Zeta SH-01H, AQUOS Compact SH-02H, and Disney DM-01H. These phone were announced partnering with the NTT DoCoMo, a predominant mobile phone operator in Japan. The Aquos Zeta comes powered by 64-bit Snapdragon 808 Hexa-Core Processor clocked at 1.8GHz. The dimensions of the device include 139x74x8mm and weighs around 151 grams. It comes with a 5.3-inch IPS LCD with 416PPI (pixel density) with multi-touch feature and 1920x1080pixels as its resolution. It is a Dual-SIM smartphone and supports dual Standby. The device packs a 3GB RAM and 32GB as internal Storage and can be expanded up to 32GB using an external MicroSD card. It comes with a 13 Mega Pixel rear camera with F/1.9 aperture which records FHD Videos up to 1080p resolution at 30 frames per second. It is capable of shooting videos in slow motion, videos in Full HD resolution can be shot at 120 fps while 480p videos can be shot in 210 fps. The device packs a 3100mAh non-removable battery and runs on Android Lollipop 5.1. Wi-F- 802.11.b/g/n, Bluetooth Version 4.0, 2G/3G/4G, Micro USB Type 2.0 and NFC are the connectivity features available on the device. The device is available in three color variants Blue, Magenta, Black and is expected to be released by the end of November. 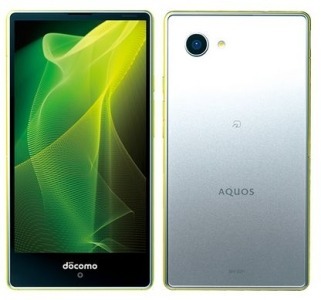 Aquos Compact is the other device that was announced by the Sharp. It comes powered by the same Qualcomm Snapdragon processor clocked at 1.8GHz. The dimensions of the device are 126x66x9mm and weighs around 120grams. It comes with 4.7-inch IPS display with 1920x1080x16 pixels as its resolution. It packs a 3GB RAM and 16GB as its internal storage and can be expanded up to 32GB using a TF card on your device. It packs a 2810mAH battery and runs on Android Lollipop 5.1. The device comes with a 13MP rear camera and 5MP front camera for a better selfie. The additional features of the device include Geo-tagging, Auto Focus, FHD recording(1080p). Wi-Fi, Bluetooth are the connectivity features available on the device. The third and the last device announced by Sharp Corporation is Disney DM-01H and is called as Sharp Disney. This device includes all the features of the Aqua’s Compact but has a change in the design. 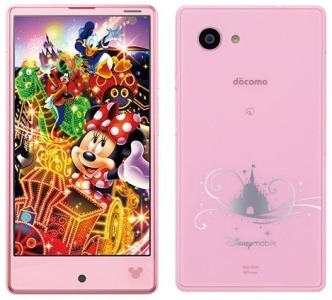 The device comes with the Disney logo on the back panel and few Disney characters and is available in two colors pink and blue. Th device can be expected to be on sales from January and price of the device is still misc. All the three devices comes powered by Qualcomm Snapdragon 808 SoC hex-core processor clocked at 1.8GHz and Adreno 418GPU. The design of the devices are much similar and comes with size bezels.